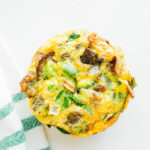 These little muffins are not only eggcellent, they’re keto-friendly. The ingredients are collagen boosting foods. What is collagen you ask? Well, think of it as the glue that holds your body together. Let’s talk about the star of the show here: eggs. We all know eggs are delicious and a great source of protein, but they also help keep skin and joints healthy because they contain lutein and zeaxanthin[*]. They’re also choline-rich, which means they greatly assist in liver and brain development. This is because choline is a macronutrient that our bodies already produce but we mostly need to get it from our food. Moving on to the vegetables. With spinach you’re getting vitamins A and K, as well as folate. It has anti inflammatory and antioxidant abilities and is easily one of the most nutrient dense plants out there[*]. Bell peppers and onions both contain vitamin B6. Studies have shown that vitamin B6, when taken or eaten with foods rich in folate (hi, spinach), reduce total homocysteine levels. High levels of homocysteine are linked to inflammation and the development of heart disease[*]. Mushrooms are a good source of phosphate, potassium and selenium. They, too, help fight inflammation. Now that you know more about why the ingredients are so beneficial for your health, let’s get to the recipe. Pro tip: batch cook these on a Sunday for an even quicker morning fix. Preheat oven to 350 degrees and grease a muffin pan and set aside. In a medium sized bowl add all of the ingredients, stirring together until well combine. Grease a muffin pan with coconut oil and gently pour in the egg mixture. Cook for 20-25 minutes, or until golden brown.